A former karate champion, Anne-Marie is no stranger to pushing herself to the limit to succeed. 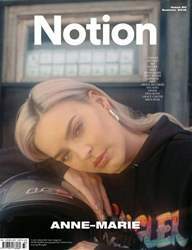 Having cut her teeth with Rudimental, Anne-Marie's solo endeavours have seen her rise to stratospheric levels of fame, headlining arenas, working with international stars and landing a feature on a Christmas number one. In the space of two years, Anne-Marie has become one of the biggest pop stars in the UK. For Notion 80, we meet the Essex-born star and find out how being an empath has shaped her career, why she's never more at home than on stage and how she came to the conclusion that sleep is a waste of time.